(Natural News) Odor and wetness shouldn’t come with a price greater than the cost of a deodorant stick, but unfortunately there is mounting evidence that when you buy conventional deodorant, you not only pay now, but you also pay later in medical expenses. Do you really want to be that guy or girl that cheaps out on deodorant, then has a serious health scare later on in life, by saving a few measly dollars? 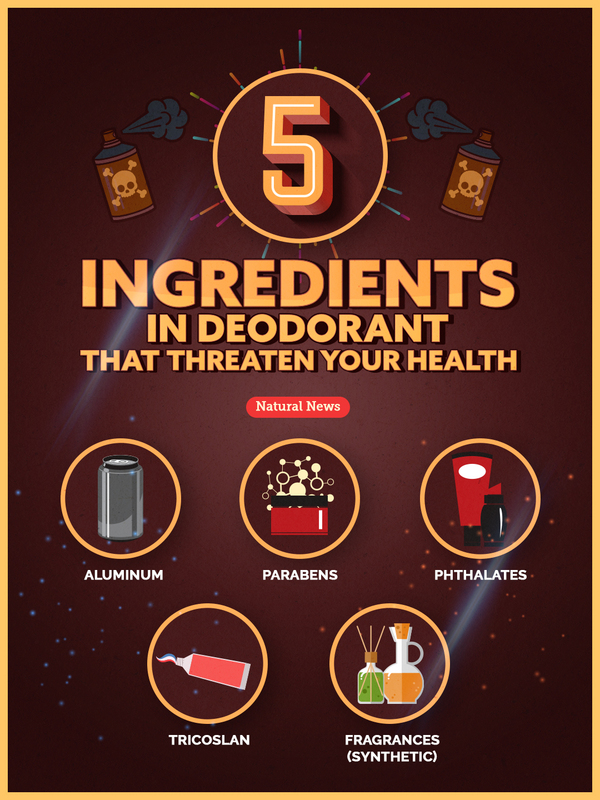 If you’re still not sure if conventional deodorant is a real threat to your health then take a few minutes to read these eye opening facts about conventional deodorant, and then determine if you want to risk disease, especially when there are perfectly legitimate solutions. The problem with most deodorants are the toxic ingredients that they are filled with, and incorrectly assuming that unless we eat or inhale something, it has no effect on your health. Nothing could be further from the truth. In fact, it’s much worse. Deodorants contain chemicals that can pass through the skin barrier, just like transdermal patches that deliver medications or nutrients through the skin. 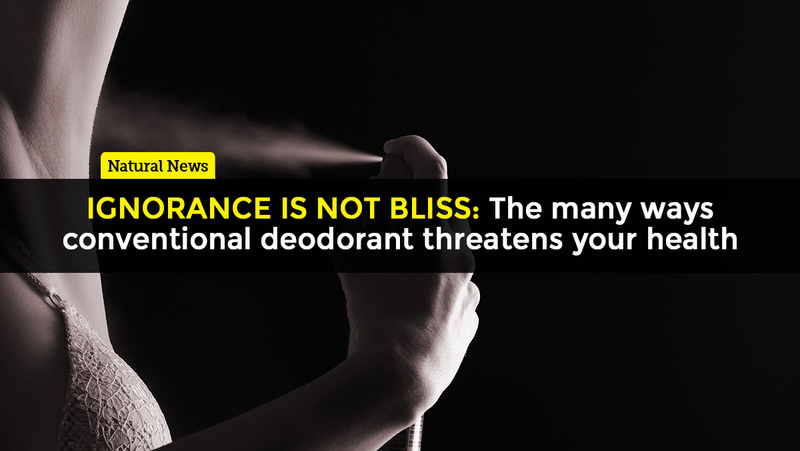 With deodorant it may be an unintended consequence, but it’s real and potentially a very dangerous one for you and your health. Uh-oh. The dangers of these chemicals just got real. Do you really want to tangle with the toxic offenders below, knowing the potential ramifications? Especially when there are effective and safer alternatives? Of course you don’t, but let’s make sure we identify and outline the dangers of chemicals commonly found in conventional deodorants to drive the point home. It may seem counterintuitive that one of the most toxic heavy metals, aluminum, would be added to deodorants but it serves a specific purpose of blocking your sweat glands so the amount of sweat that is secreted is limited. Unfortunately, this has a couple not-so-fun consequences. First of all, research published in 2014 found that using antiperspirants can actually make your armpit odor worse. Researchers found that aluminum in antiperspirants killed off very little odor causing bacteria, while allowing bacteria that produce more pungent odor to proliferate instead. So consistent use of these products may eventually leave you stinker than before, and with major health consequences. The second, bigger issue is that aluminum is a heavy metal that can cause gene instability and promote the growth of tumors. It has also been linked to hormone disruption, negatively affecting the liver and the brain. Bottom line, this heavy metal has no functional place in the body, and can only have unfriendly consequences. Parabens are preservatives used in many different personal care products. They have been shown to be hormone disruptors that bioaccumulate in the body. They have also been linked to early puberty in children, organ toxicity, and increased risk for developing prostate and breast cancer. This chemical compound helps the “desirable” components of the deodorant (like fragrance) to stick to your skin. Phthalates are hormone disruptors that are toxic to the reproductive glands of both men and women. It may affect fetal development in women, and has been linked to lower IQs and asthma. A common ingredient used to kill bacteria on the skin, it is so commonly used in products that 75 percnet of Americans have detectable levels in their bloodstream (more proof that the skin does let it in). Tricoslan has been linked to hormone disruption and disruption of beneficial bacterial growth in the gut, according to animal studies. There is also evidence that it impairs thyroid function. Unfortunately, the chemical ingredients in “fragrance” is concealed and protected by trade law, so we can’t really know what concoction has been brewed up inside that common ingredient. However, fragrance has been linked to issues with the skin and lungs. Unfortunately there are more ingredients, each with their own toxicity and health impairments, such as propylene glycol, artificial colors, triethanolamine (TEA) and diethanolamine (DEA), and steareth-N. Any one of the identified ingredients above can cause serious health concerns, and the combination of several make conventional deodorant a game of Russian Roulette. Pull the trigger one too many times, and the results will be disastrous. For more on chemicals in your daily life, visit Chemicals.news. Needless to say, you have options and if you care about your health, you should exercise them. Choosing an aluminum, paraben, phthalate, tricoslan, and fragrance free deodorant will ensure you don’t come into contact with toxic and synthetic ingredients that will pollute your body. This is why I appreciate the Health Ranger Select Organic Deodorants or Magnesium Liquid Deodorants, because they are devoid of all these things, and contain more nourishing ingredients like essential oils, coconut oil, and beeswax. You can check out the various choices, here. Your armpits and your body will thank you. ‘I try to only take it twice a week – I’d have a breakdown if I took it every day’: Why are so many women taking brain boosting pills at work and risking their health and sanity?